The team wanted to connect space to Cambridge in as unique a way as possible. They decided to break with 100 years of tradition and power their punt with a rocket, burning off half-dozen Chelsea buns from local cafe "Fitzbillies" as fuel. Whereas, traditionally, you could power your journey by eating a Chelsea bun, metabolising it in your body and using the resultant energy in your muscles, a rocket provides a much louder, and marginally faster, method of propulsion by simply burning the buns. They are doused with a liberal helping of liquid nitrous oxide, which provides an oxygen-rich environment to encourage burning. Once they are ignited, the buns produce very hot gases inside the combustion chamber, causing the pressure to increase. The open rear-end of the combustion chamber provides the easiest route out for the expanding hot gases. This causes the gases to rush out of the opening and provide forward thrust, in the same way that you would be pushed backwards if you were to try and throw a bowling ball whilst on roller-skates. When Jon London - the world's first 'puntonaut' - was asked about the intricacies of the punt's controls, he revealed that, to brake, he would be looking to "find a handy side of the River Cam, and bump into it." Steering was non-existent, "We're kind of just point-and-shoot." Nonetheless, he wasn't feeling nervous about his groundbreaking voyage, having driven several other more extreme rocket-powered vehicles previously. Indeed, it has become a tradition of his to smoke a cigar upon completing each journey so that "being in the rocket vehicle isn't the most dangerous thing I've done that day." After one false start, Jon managed to ignite the Chelsea buns, spurred on by the arrival of his wife and baby daughter. 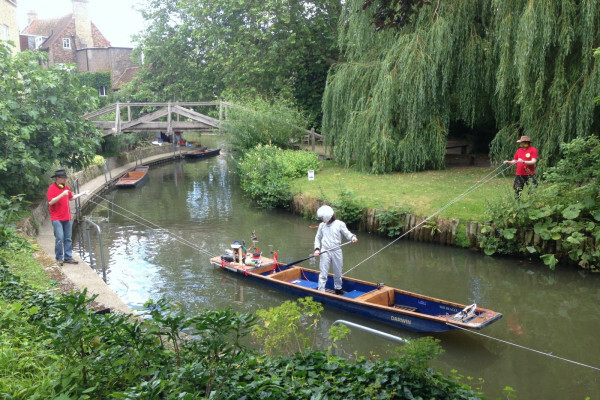 The punt powered along the Cam to great fanfare for about 20m, before it encountered a riverbank and came to rest, its maiden voyage complete. Yet all of this was not without purpose. The Cambridge Science Centre was aiming to promote its upcoming exhibition Cosmic, which explores the vast expanses of space. The guiding principle of the organisation is to put the life back into science, which can sometimes become "an academic exercise" in the classroom, according to Cindy Forde, the group's CEO. "The more [children] understand about how their world works, the more able they are to make a positive contribution to it," she went on. "Simply by understanding about themselves, that they can learn and they have this wonderful potential, then we inspire them to go on and make the most of themselves." Voice acting: art or science?